A new mechanism may explain how great earthquakes with magnitudes larger than M7 are linked to coastal uplift in many regions worldwide. This has important implications for the seismic hazard and the tsunami risk along the shores of many countries. The mechanism is proposed by an international team of scientists led by Vasiliki Mouslopoulou of the GFZ German Research Centre for Geosciences in the journal Tectonics. The idea is that series of severe earthquakes within a geologically short period of time cause the rising of the land where one tectonic plate slips beneath another slab of the Earth's crust in a process called subduction. To test their hypothesis, the scientists investigated ancient coastlines that were preserved over time, so-called paleoshorelines, to determine the rate of uplift over past millennia. 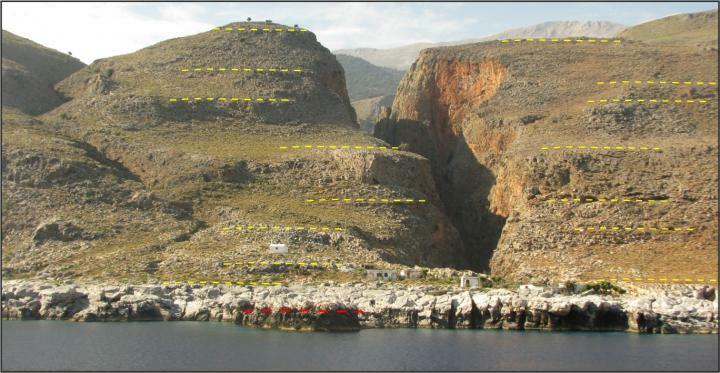 Vasiliki Mouslopoulou says: "It is not unlikely that coastlines along active subduction margins with no detectable tectonic uplift over the last 10,000 years will accommodate bigger than M7 earthquakes in the near future." Uplift is common along the coastlines of continents at subduction systems worldwide (e.g., Kamchatka, Japan, New Zealand and Papua New Guinea) with rates of vertical uplift accrued over the last 10,000 years being generally higher – up to ten times more than for time intervals larger than 125,000 years. This rate variability is odd and requires explanation. The origins and the magnitude of these rate variations were examined by German (GFZ) and New Zealand (University of Canterbury) scientists using a global data set of 282 uplifted paleoshorelines from eight subduction margins globally (Italy, Greece, New Zealand, Japan, Papua New Guinea, Iran-Pakistan, Chile) and 2D numerical models. Paleoshorelines are a useful tool to constrain the magnitude and mechanisms of this uplift, as they are often spectacularly preserved as wave-cut platforms, benches and sea-notches, providing a geological record of the interplay between sea-level changes and rock uplift. Data analysis and modelling suggest that varying uplift rates along subduction margins are mainly a short-term phenomenon. For geologists, short term means shorter than 20,000 years. These uplift rates cannot be accounted for by plate-boundary processes, as previously thought. Instead, they reflect a propensity for natural temporal variations in uplift rates where recent (not more than 10,000 years ago) uplift has been greatest due to temporal clustering of large-magnitude (bigger than M7) earthquakes on upper-plate faults. Given the size and geographical extent of the analyzed dataset the conclusions of this work are likely to have wide applications. Asked what's new with these findings Vasiliki Mouslopoulou explains: "For the first time temporal clustering of great-earthquakes is shown on active subduction margins, indicating an intense period of strain release due to successive earthquakes, followed by long periods of seismic quiescence." This finding has applications to the seismic hazard of these regions, as it highlights the potential for future damaging earthquakes and tsunamis at active subduction margins with no measurable recent uplift. In such cases, paleoshorelines older than 10,000 years could provide an important constraint for hazard analysis. In other words: To assess the likelihood of future great quakes it will help to look at paleoshorelines. Further, it alerts scientists that earthquake clustering may not only characterise shallow faulting and smaller-sized earthquakes with magnitudes lower than M7 but it is a property of large subduction earthquakes. This work presents a conceptual model in which strain is released by temporally clustered great-earthquakes that rupture faults within the upper-plate as opposed to the zone where the tectonic plates meet (plate-interface). Onno Oncken of GFZ comments: "This is an intriguing finding that changes the stereotype view that all or most great subduction earthquakes occur along the active contact, i.e. plate-interface, of the two converging plates. We hope that this new finding will promote the mapping and discovery of such faults along active subduction margins and will also help explain the variability in the recurrence of great-earthquakes encountered on many subductions globally."